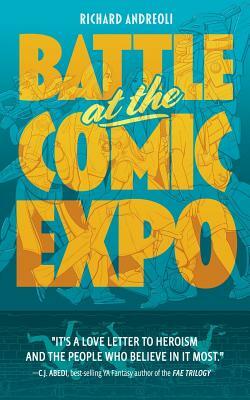 Get ready for Klingon-speaking Cosplayers, cutthroat convention politics, and the unlikeliest heroes ever known in the epic dark comedy Battle at the Comic Expo. Ron Lionel is the hottest creator working in comic books today. His comic series, The Enduring, sells out every month and is set to become a major motion picture. Ron has no problem using his status to get what he wants, whether that be special treatment from his publisher or seducing fangirls. Joe Cotter, on the other hand, gave up his dreams of being a writer years ago, and now lives for a steady paycheck. Joe's sense of right and wrong was born from years of reading comics, fantasy novels, and growing up in fandom, and as the security chief for America's Finest Comic Book Expo he's as strong-willed as any hero with a power ring. Enter Velma, an obsessed fan with a twisted sense of reality and some disturbing questions about The Enduring. When her righteous plan to gather answers backfires, the two men are accidentally abducted and left in a seedy motel room. Now these two unlikely allies must work together to save themselves and the convention before Velma's mania takes over and destroys them all. From drug-sniffing celebrities and uptight volunteers to long-forgotten tunnels under the streets of downtown San Diego, one fact remains clear: The truth is never simple, it's sometimes darker than expected, and is often hidden just beneath the surface.